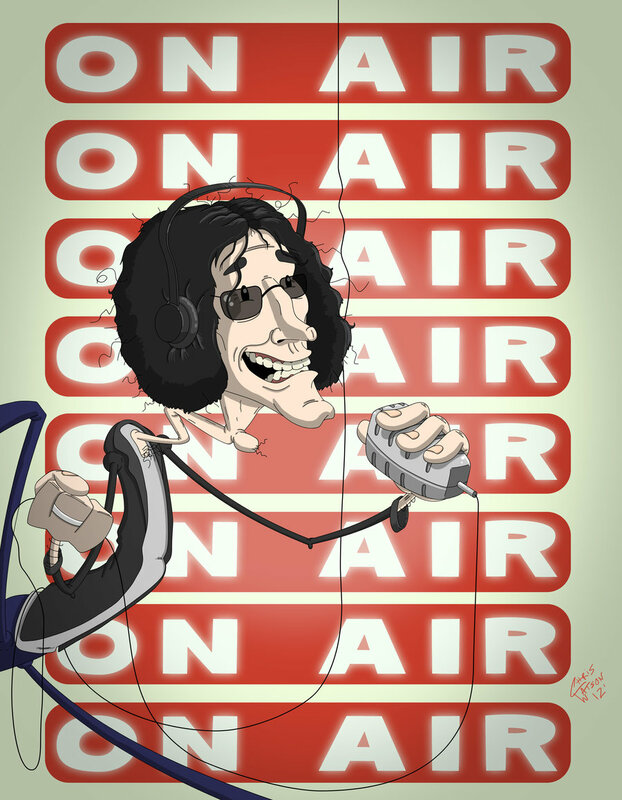 Is Internet Radio the Future for Howard Stern? What is SiriusXM without Howard Stern? The answer: not much, unless there are more Oprah, Eminem and Martha Stewart fans out there to create a large enough draw to take his place. Too bad there aren’t. Who else is going to ask Katey Sagal about whether or not Gene Simmons tried to sleep with her while she worked on his solo album? Or get Bryan Cranston to divulge the story of how he lost his virginity to a Danish prostitute that offered her services for the money in his pocket? The “King of all Media” has had a loyal following since he went viral on terrestrial radio over three decades ago. Stern is also loyal to his fans, bringing callers on as regular show participants and even working through Hurricane Sandy, showing up to work both Monday and Tuesday despite the hazardous conditions in New York City. But what does the future hold for satellite radio? An estimated 60 percent of new vehicles sold are equipped with satellite radio compared to just 20 percent five years ago. 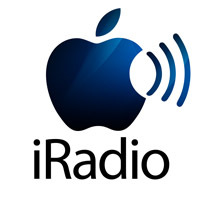 But now, with the presence of wireless internet (think Cadillac (NYSE: GM) Wi-Fi and Chrysler’s (OTC: FIATY) Uconnect) becoming more common in new vehicles, and services like Pandora (NYSE: P) offering other alternatives to traditional radio, Stern may no longer need Sirius XM. Stern could feasibly create his own service — perhaps even his own network — to broadcast his show to the masses without requiring his listeners to cover the cost of 120 other channels that they will never listen to. Or, if Stern was not inclined to become a free agent, he could take his service, followers and loyalty to the next level and become a viable and attractive option to wireless internet providers and telecommunications companies. Sirius XM already has plans to provide internet and television content to vehicles equipped with Wi-Fi, but it isn’t likely to be the only one. It is logical that soon enough services from Google and Apple will appear in vehicles. The need to place a satellite into orbit was once a limiting factor on radio alternatives, but the shift to the internet means options are endless for Stern’s next venture. Apple’s entry into the Internet radio market have caused havoc with Pandora’s stock. It has dropped 40% since the rumor has been circulating in the last couple of months. Apple’s new Internet product is rumored to allow the listener to listen to the content selected as opposed to a pre-determined playlist. Whether or not this will have a huge impact on Sirius is hard to say. Sirius has made more of a name having hosting personalities, such as Howard Stern and several other talk radio programs, the music programming is almost a secondary consideration to its overall survival. Although Sirius XM does not release numbers on listener statistics, estimates put Stern’s following anywhere from between 1.2 and 1.7 million listeners on live shows. Sirius XM closed Friday at $2.82, down 3.42%. Year to date, the stock is up 54.95%, a trend that could continue assuming Stern remains with the company and no more lawsuits are filed. Sirius XM reports its third quarter earnings on November 1, and the company is expected to report $873 million in adjusted revenues for an increase of 14.1 percent from the year ago period. Howard Stern close to signing 3 year – $600 million contract with iTunes? 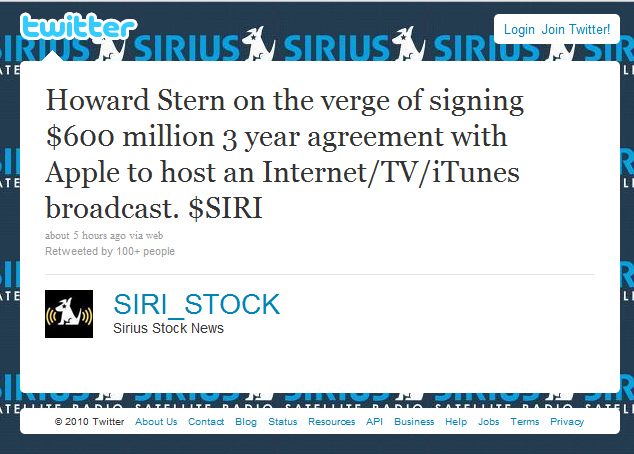 An odd tweet gathered momentum today that claimed Stern is on the verge of signing a 3 year, $600 million dollar deal to host his show on Apple’s iTunes. 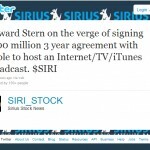 The tweet originated under the name “SIRI Stock” and linked to a Sirius XM’s Investor Relations webpage. There is no absolutely no reason to believe the claim since anyone can say pretty much anything on the social web site.